Saunders Havill Group are proud to have delivered approval of the proposed Aldoga Abattoir Facility and Solar Farm, located in the Gladstone State Development Area (GSDA) between Mount Larcom and Gladstone, Central Queensland. SHG’s professional environmental, surveying, landscape architecture and town planning consulting services were integral in achieving the successful approval of the project. 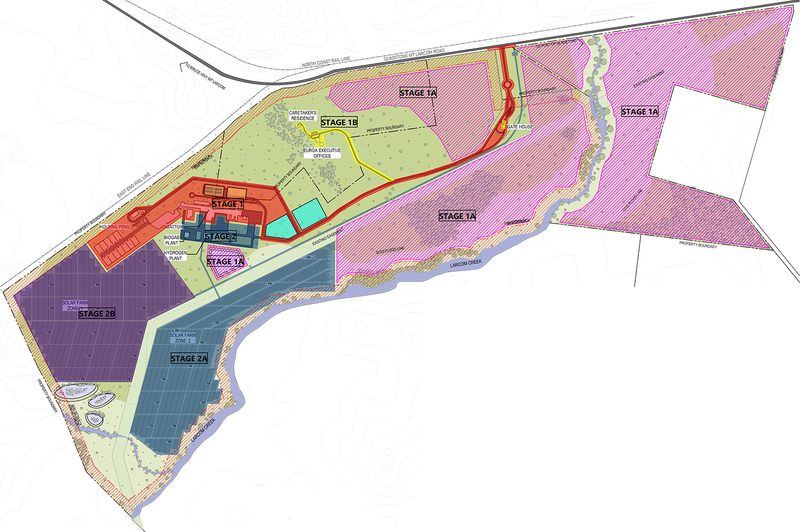 The proposal required the engagement of a number of stakeholders and professional consultants, which were effectively led by SHG Town Planning Principal, Nick Christofis and Central Queensland Regional Manager, Lewis McKee. The project represents an extensive planning process, spanning a number of years and significant stakeholder engagement by both the proponent and project team. Renewable Energy Facility (Solar Farm) that will provide power for the proposed abattoir and processing plant. Stage one of the approved development involves the construction of the main service road running through the site. From this will stem a Gatehouse facility and all associated security measures, the main Abattoir facility and a portion of hardstand needed to initially service beef production. Also included within this stage will be the construction of holding pens necessary to facilitate initial production, which will coincide with the inception of the on-site wastewater management plan. With all waste dealt with internal to the site, a 45 megalitre irrigation pond will be formed to the south of the Abattoir, where treated water will be taken to irrigate throughout the suitable unused areas of the site. The Gatehouse, Caretaker’s Residence and Executive Offices will all be constructed in conjunction with the main Abattoir facility. Due to their domestic scale, it is intended that construction of these facilities will be completed by locally sourced residential contractors where possible. The following stages will see construction of a Solar Farm located on the south-west corner of the property. Ancillary Bio Gas and Hydrogen plants will be brought online upon completion of the Abattoir, while construction of the Solar farm will commence upon the completion of the preceding actions. The two zones will then be merged and managed through one outlet, providing necessary electricity to all on site facilities. The abattoir, processing, freezing and packing facility was designed to incorporate the latest in red meat processing plants, including a total integration of the latest and most advanced technologies using robotic systems and digitalisation. The site is also home to the existing Euroa Homestead, a significant and important local heritage landmark, which is proposed to be renovated and improved to house the operation’s formal office facilities and will include a functions area to showcase the state-of-the-art operations and the site’s history to the industry. Through their involvement in this exciting project, the SHG team have demonstrated their expertise and extensive experience in working with the Coordinator-General’s Office, specifically the State Development Areas Division (SDAD). SHG along with the project team, including lead Engineering consultant Pitt & Sherry, were able to successfully resolve a number of complex issues relating to the transport of both product and staff to and from the site, protection of environmental values and rural amenity, protection and enhancement of a local heritage asset and mitigating development impacts. This ultimately lead to securing approval of the project from the Coordinator-General. Saunders Havill Group congratulates the proponent and our client on a successful outcome and we look forward to assisting with the delivery of the project through the construction phase.